Social media has a lot to say about TV. Can Bluefin cash in on that? The key to Bluefin’s technology is the ability to map the “TV genome.” Here, all the social-media comments hover above all the TV content at a given time. Bluefin’s algorithms connect the language of the comments to their context–what’s on TV. Taken together, those connections create a feedback loop between viewers and content, revealing how people are reacting to what they’re watching in real time. Bluefin links social media comments to TV by filtering all incoming comments through a “video fingerprint” of the shows and commercials currently airing. $1.15 million from the NSF, they got $1.2 million from angel investors and $6 million from Redpoint Ventures. Next year, Roy says, the company will seek more funding. But Roy doesn’t think Bluefin is competing against Nielsen, nor does he think it’s competing against Twitter, which already supplies networks with data but only captures one facet of social media. Roy says his company offers something different. How many people tune in is important, he admits. But such numbers can’t give advertisers or networks the granular information revealed by his computers. What’s more, Bluefin can mine connections among shows, social media, and advertisements. For instance, this summer, Diet Pepsi studied audience reactions to an advertisement starring Modern Family‘s Sofia Vergara. During the airings of the ad, social-media comments about Diet Pepsi increased about 19%. Bluefin collected data from 1.8 million people who commented on TV shows on which the ad played. Then they discerned “affinities” by finding out how many commenters were saying something about each show and Diet Pepsi. Understanding these affinities gives Diet Pepsi something valuable for the future: Directing more ad dollars to the commenters’ favored shows may prove far more efficient. For a Chevy Cruze ad, meanwhile, Bluefin generated a cloud of common words gleaned from social-media responses. In the ad, a man kisses a woman goodbye, drives off, and asks his car to read his Facebook news feed, which reports the woman’s latest status update: “Best first date ever.” He smiles. But the audience, Bluefin discovered, did not. Crash and WTF were popular, according to the cloud, and Chevy was only the third most-mentioned word–coming in after car and Facebook. Overall, 58% of the comments were negative. more fine-grain ways than positive or negative–they love to hate a character, they’re sarcastic, that type of thing.” It’s easy for humans to discern the difference between expressions of happiness and anger, in other words. But not so for computers. That may soon change. Roy’s algorithms have the ability to fine-tune themselves, learning what he calls “the language of television” by employing machine-learning techniques. For instance, his algorithms have uncovered differing emoticon styles. A simple  will signify a commenter who is, on average, 10 years younger than one who writes :-). Such small nuances give comments additional meaning and value. For Roy, though, that argument is more about business than pleasure. His company’s databanks contain any show he could ever want to watch–but there’s no time. These days, he admits, he just doesn’t watch much TV. 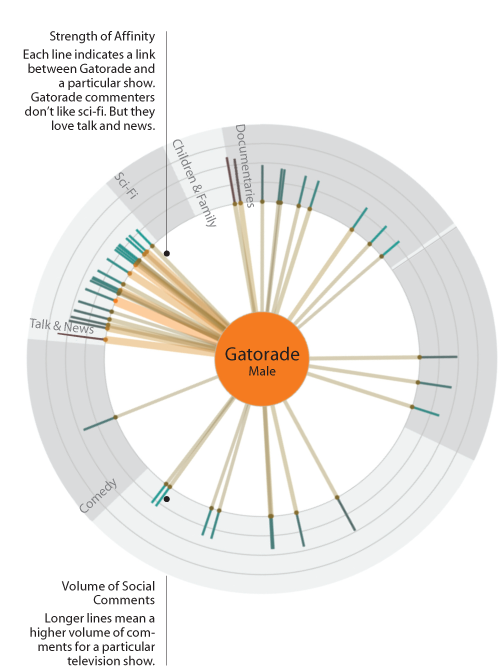 With a trove of big data–5 billion online comments and 2.5 million minutes of TV per month–Bluefin charts the complex relationship of male TV viewers to Gatorade.